When we think about the Canadian landscape, we might picture a postcard image of sparkling, clear blue lakes, or the moss-cloaked wildness of a temperate rainforest. The reality, however, is something all too different. “It’s All Happening So Fast: A Counter-History of the Modern Canadian Environment,” at the Canadian Centre for Architecture, seeks to complicate these romanticized images. The exhibit features a diverse collection of visual work, installations, and materials from numerous artists, archives, museums, and galleries. In an attempt to uproot common assumptions about the natural environment, this exhibit explores the effects of widespread pollution, nuclear contamination, overstressed fisheries and forests, and the exploitation of Indigenous lands, over the past five decades. “It’s All Happening So Fast” questions the gap between the ‘real’ and ‘imagined’ versions of Canada’s environmental history, and demonstrates that a more balanced view lies in the space between. The exhibit opens with Vancouver-based artist Douglas Coupland’s Slogans for the 21st Century, a wall of over a dozen vividly colourful but disquieting messages: “Lonely Isolated People Consume More,” one picture declares. “The Internet Makes Environmental Degradation Tolerable,” states another. Unlike the rest of the exhibit, Coupland’s statements are not part of a specific historical tradition – they feel current, or at least from a not-so-far-off future. Slogans is unsettling because it foreshadows the near and unavoidable consequences of environmental recklessness, and contextualizes the exhibit’s exploration of the rift between ecological conservation and economic development in a bold and visceral way. “It’s All Happening So Fast” questions the gap between the ‘real’ and ‘imagined’ versions of Canada’s environmental history, and demonstrates that a more balanced view lies in the space between. Working through the exhibit, the viewer gets the the persistent sense that, over the past five decades, both everything and nothing has changed. One area invites visitors to sit in a room surrounded by photographs and ephemera from Deep River, a planned community near the nuclear industry of Chalk River in Southern Ontario. A friend and I flipped through a sixty-year-old issue of MacLean’s, marvelling over ads acclaiming the use of industrial products like nickel and synthetic petrochemicals. The ads and articles highlighted the stark contrast between daily life then and now. At the same time, we were surrounded by dozens of CBC media clips that could just as well have been broadcast today. These were images of environmentalists opposing pollution, Indigenous peoples resisting the degradation of their sovereign lands, and experts warning about the effects of the industry on the health and well-being of human and animal communities. The ongoing history of Canada’s environmental destruction in the name of economic development has always been at odds with nationalist images of pristine wilderness: from the glorious Rocky Mountains to the windswept Atlantic coast. 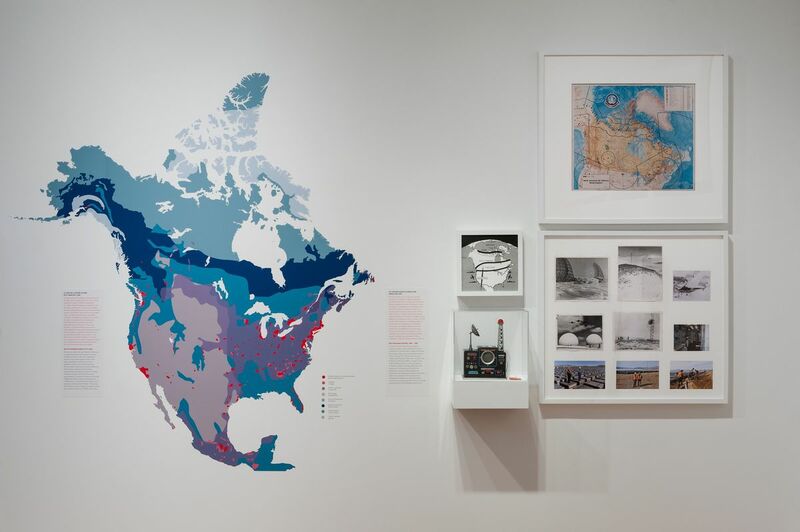 The exhibition illuminates the discrepancy between this imaginary of Canada and the reality of our environmental record. The story of such a polar relationship, told here through diverse and overlapping multiple, intersecting voices and media mediums, evokes questions of competing economic and political interests, legal frameworks, cultural ideals, the resurgence of Indigenous communities, and environmentalisms. Nevertheless, the exhibition could have further emphasized the story of how this land and its resources were violently appropriated from Indigenous peoples in order to form Canada in the first place. These were images of environmentalists opposing pollution, Indigenous peoples resisting the degradation of their sovereign lands, and experts warning about the effects of the industry on the health and well-being of human and animal communities. Despite this lack of acknowledgement, the exhibit successfully accomplishes the ambitious goal of engaging visitors in a broad consideration of our common assumptions and the dominant narratives. It further highlights the fact that these assumptions are woven into the ways we collectively live on this land, and invites us to imagine a sustainable and ethical way forward. As a call to action, “It All Happened So Fast” catches visitors between the wryness of Coupland’s technological truisms and the somber familiarity of fifty years’ worth of environmental calamity. Exposing the gap between an imaginary pristine nature and a depleted environment, the exhibit calls for immediate collective action. It suggests that climate crisis requires solutions catalyzed by cultural shifts and nation-wide self-reflection. “It’s All Happening So Fast” asks us the weighty questions. Whom is the environment for? Are we a part of our environment, or do land and resources exist specifically for our consumption? The exhibit provides the counter-hegemonic context we need to answer these questions as informed, engaged citizens. The way forward might not be as short and quick as the way here, but this exhibit demonstrates that we are starting to move in the right direction. Through multiple media, perspectives, and stories, visitors are inspired to challenge assumptions and see our diverse landscapes in a way that is seldom portrayed, and ultimately, to take part in transforming the current narrative. The exhibit runs until April 9, with free admission for students. For more information about this exhibition, please visit the Canadian Centre for Architecture’s website.